Daniel Hudson Burnham (September 4, 1846 - June 1, 1912) was an American architect and urban planner. Considered the preeminent architect in America at the turn of the twentieth century, Burnham was the Director of Works for the World's Columbian Exposition and designed several famous buildings, including the Flatiron Building in New York City and Union Station in Washington D.C..
Burnham is also remembered for his plans for such major cities as Chicago, Cleveland (the Group Plan), San Francisco, Washington, DC (the McMillan Plan), and Manila and Baguio in the Philippines. In planning cities like these, Burnham was able to overcome financial and logistical hurdles, all the while incorporating his own personal style. Much of his career work modeled the classical style of Greece and Rome. The essence of Burnham’s work is captured in his quote, "Make no little plans. They have no magic to stir men's blood and probably will not themselves be realized." Burnham was born September 4, 1846, in Henderson, New York and raised in Chicago, Illinois. His parents brought him up under the teachings of the Swedenborgian Church of New Jerusalem, which ingrained in him the strong belief that man should strive to be of service to others. After failing admissions tests for both Harvard and Yale, and an unsuccessful stint at politics, Burnham apprenticed as a draftsman under William LeBaron Jenney. At age 26, Burnham moved on to the Chicago offices of Carter, Drake, and Wright, where he met future business partner John Wellborn Root (1850-1891). 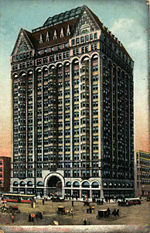 Burnham and Root were the architects of one of the first American skyscrapers, the Masonic Temple Building in Chicago. Measuring 21 stories and 302 feet, the Temple held claims as the tallest building of its time, but was torn down in 1939. Under the design influence of Root, the firm had produced modern buildings as part of the Chicago School. 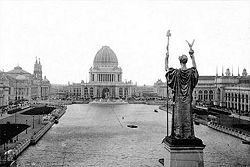 Following Root’s premature death from pneumonia in 1891, the firm became known as D.H. Burnham and Co..
Burnham and Root had accepted responsibility to oversee construction of the World's Columbian Exposition in Chicago’s then-desolate Jackson Park on the south lake front. The largest world's fair to that date (1893), it celebrated the 400-year anniversary of Christopher Columbus' famous voyage. After Root's death, a team of distinguished American architects and landscape architects, including Burnham, Frederick Law Olmsted, Charles McKim, and Louis Sullivan, radically changed Root's modern and colorful style to a Classical Revival style. Under Burnham's direction, the construction of the Fair overcame huge financial and logistical hurdles, including a worldwide financial panic and an extremely tight time frame, to open on time. Considered the first example of a documented comprehensive planning project in the nation, the fairground was complete with grand boulevards, classical building facades, and lush gardens. Often called the "White City," it popularized neoclassical architecture in a monumental and rational Beaux-Arts plan. Architects in the United States were soon being asked by their clients to incorporate similar elements into their designs. 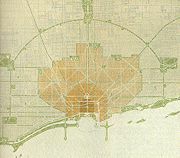 Beginning in 1906, Burnham and assistant Edward H. Bennett prepared The Plan of Chicago, published in 1909, which laid out plans for the future of the city. It was the first comprehensive plan for the controlled growth of an American city, an outgrowth of the City Beautiful movement. The plan included ambitious proposals for the lake front and river, and declared that every citizen should be within walking distance of a park. Sponsored by the Commercial Club of Chicago, Burnham donated his services in hopes of furthering his own cause. 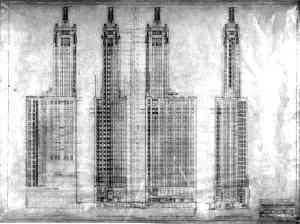 Plans and conceptual designs of the south lakefront  from the Exposition came in handy, as he envisioned Chicago as a "Paris on the Prairie." French-inspired public works constructions, fountains, and boulevards radiating from a central, domed municipal palace became Chicago's new backdrop. The plan set the standard for urban design, anticipating the future need to control unexpected urban growth. Burnham’s city planning projects did not stop at his Chicago designs; Burnham helped shape cities such as Cleveland (the Group Plan), San Francisco, Washington, DC (the McMillan Plan), and Manila and Baguio in the Philippines, details of which appear in The Chicago Plan publication of 1909. The Plan for Manila wasn’t fulfilled, except for a shore road, which became what is now Roxas boulevard. Much of his career work modeled the classical style of Greece and Rome. In his 1924 autobiography, Louis Sullivan, considered by many to be the greatest architect from the Chicago School, chastised the late Burnham for his lack of original expression and his dependence on Classicism. Sullivan claimed the neoclassical example of the World's Fair had "set back architecture fifty years;" corporate America thought differently. Burnham was quoted as saying, "Make no little plans. They have no magic to stir men's blood and probably will not themselves be realized." (Moore-1921) This slogan is considered to capture the essence of Burnham's spirit. A man of influence, Burnham was considered the preeminent architect in America at the turn of the twentieth century. He held many positions during his lifetime, including two-time president of the American Institute of Architects. When Burnham died in 1912 in Heidelberg, Germany, D.H. Burnham and Co. was the world's largest architectural firm. Legendary architect Frank Lloyd Wright eulogized, "(Burnham) made masterful use of the methods and men of his time... (as) an enthusiastic promoter of great construction enterprises... his powerful personality was supreme." His firm continues its work today under the name Graham, Anderson, Probst & White, which it adopted in 1917. Almost as a tribute to his urban planning ethos, Burnham's final resting spot is given special attention, being located on the only island in Uptown, Chicago's park-like Graceland Cemetery. Burnham's personal and professional papers are held in the Ryerson and Burnham Archives at The Art Institute of Chicago. In his honor, the American Planning Association has also named a major annual prize the Daniel Burnham Award for a Comprehensive Plan. ↑ New Church Org., The New Church/General Church of the New Jerusalem, 2007. Retrieved December 15, 2007. ↑ Pat Sabin, The History and Architecture of Chicago, Illinois. A Tour Of The City in Vintage Postcards. Retrieved December 15, 2007. ↑ The Commercial Club of Chicago, Commercial Club of Chicago, 2007. Retrieved December 15, 2007. ↑ Digital ID: cph 3c30969. Source: digital file from b&w film copy neg., Library of Congress, 2007, Retrieved December 15, 2007. ↑ American Institute of Architects, American Institute of Architects, 2007, Retrieved December 15, 2007. Moore, Charles. 1921. "XXV "Closing in 1911-1912" in Daniel H. Burnham, Architect, Planner of Cities, Volume 2. Boston, Massachusetts: Houghton Mifflin. 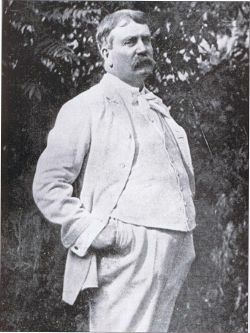 The Burnham Plan An article on his work in the Philippines. This page was last modified on 16 November 2017, at 16:03.